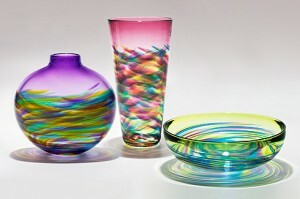 The glass blowing of Toots Zynsky of Pawtucket R.I. is featured in this month's New England Home Magazine. She uses some amazing colors and shapes to create real pieces of art. If you're looking for local glass artist in the Stowe area check out the work of Little River Hotglass Studio & Gallery where Michael Trimpol has been blowing glass since 1995. Down route 100 you can also visit Ziemke Glassblowing Studio also opened in 1995. To read more about Toots click the link below. Motion Studies | New England Home.